Minor floods may sound better than major floods, but even slight flooding can wreck havoc on a home. Flood clean up can be time consuming and costly, and result in ruined carpeting, mold growth and other problems, even if the actual incident were not severe by some standards. There are, however, ways of mitigating the damage caused by flooding and precautions to keep it from being a repeat problem. A flooded basement demonstrates the destructive power of water. 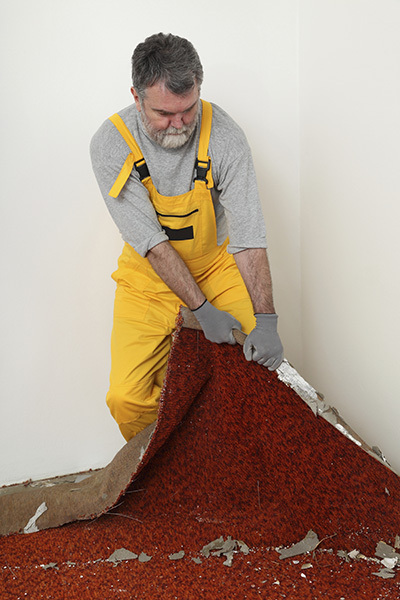 Waterlogged carpets will often have to be replaced entirely if they cannot be dried quickly. Unfortunately, the full extent of the water damage is not noticed in many cases until it is too late. Mold takes advantage of the wet, warm environment to grow in walls or on the undersides of carpeting. Mold removal from carpeting is not easy and sometimes it is easier just to replace the entire carpet. Staying on top of the situation if there were only minor flooding can prevent many problems as well. When pumping water, try to use a sink, not the yard, as that could cause the water to simply flow back into the house. Clean-up begins by removing the water and drying the area with fans, rags, and mops. Rugs can be taken out and hung up to dry. Do not stop drying the carpet until it is completely free of water, this can prevent the mold damage if done quickly enough. Document everything that has been affected by the water for the insurance company in case you can be reimbursed for damages. Once the initial problems have been solved, it is time to consider possible long term solutions to alleviate the flood damage. Many areas have cyclic flooding from either heavy rains or snow melt, and if it appears that you as a homeowner will be facing this problem again and again, you should think of the many ways the next year would be better. If the carpeting has to be taken out due to mold damage, consider replacing the carpet flooring with something easier to clean and more water resistant, such as linoleum or tile. Unlike carpet, those can be cleaned of mold using bleach-water solutions and also dry faster.